The current summer crop production season, for the period September 2015 to August 2016, has been largely defined and characterised by one of the worst droughts in our agricultural history and very variable or late rainfall in most production areas. Speaking to farmers in the main summer production area one of the most important factors for economic survival was the ability to manage crop cycles and rotations in order to be able to still plant a crop or part of a farm to a crop in the exceptionally dry conditions experienced. It is also important to able to plan to plant at the start of the normal ideal planting window period in each area. The late summer and early autumn period normal rainfall usually results in some moisture storage and retention in the soils for the next production season. Many farmers who practise monoculture of maize, for instance, were faced with a dire situation of being unable to plant the next maize or other crop at the start of the season. In order to avoid this situation in future it would be prudent to look at your own crop rotation planning and moisture conservation practices to reduce the risks highlighted above. This will ensure that a variety of crops can be planted over a much longer period from October to January in a particular summer production season. Late planted sunflowers during January and even into early February will give some farmers a business saving income under exceptionally negative climatic conditions that fell. Something is always better than nothing, especially when crop prices are high. It all comes down to moisture conservation. Monoculture crop production systems use only one cash crop which is grown from one year to the next over many years. Some of the disadvantages of this system are increases in specific crop pests such as insects and various fungus or viral diseases, build-up of weeds resistant to herbicides and the exploitation of nutrients in the same root zone which can lead to a decrease of available nutrients and root development. I am sure that there a very few farmers in the current economic and climatic conditions that have not changed from the monoculture system to include a variety of crops and a livestock factor into their farming operation. A crop rotation programme is a planned cycle of crops that will be planted in a particular land in a defined order over three to five years and even longer if fallow periods or pasture are included in the cycle. The programme will usually include a plan for the top, medium and low potential soils. All low potential soils should be taken out of crop production and put to various permanent perennial grass types. Most farms, especially in large area operations, will have many microclimates and differing soil types which need to be managed separately but planned to fit in with the objectives of the whole farm. This implies that most crop production farms will have a livestock factor that can be accommodated within the final rotational plan. The specific rotation plan for top and medium soils will be implemented on all the lands that fit into this category and divided into areas that represent the number of years in which the different crops will be grown. In the instance for example in a two crop system of maize and soybeans including a fallow system on 300 hectares of top soil the lands will be divided into convenient 100 hectare blocks. Land sizes will determine the amount allocated to each year's production and might not be exactly the 100 hectares but the principle remains. The first year's planting programme would be maize on 100 ha's, soybeans on 100 ha's, and 100 ha's left fallow. 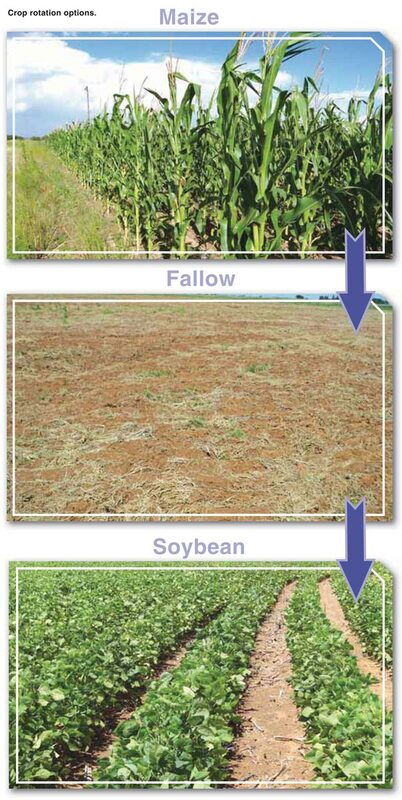 The second year's production could be soybeans on the previous year's fallow lands, maize on the previous year's soybeans leaving the previous maize lands fallow. Sunflowers could be substituted for soybeans on the medium potential soils or become an additional crop in the rotation. This would then increase the blocks required to four as well as the seasons required to complete the cycle on each block. The planting sequence of the first system mentioned above is shown in the Table 1 as simple example. As can be noted there is always going to be a crop planted on a fallow block which will ensure that the ideal planting window is used as well reducing the risk of a crop failure over the whole farm. The above system should be assessed by conducting a gross margin analysis where gross income, direct and indirect variable input costs are quantified as well as an allocation of fixed costs to each crop and fallow block. The potential profit in the cropping rotation chosen can then be calculated over a minimum of three years to determine the viability of a particular planned programme. Most farmers have already moved into a conservation tillage system which can range from stubble mulching of residues to a full no-till system. The management of each block to enhance maximum moisture conservation also requires careful thought and planning. In planning a system to suit your production area sustainable dry land crops such as maize, soybeans, sunflowers, and sorghum applicable for crop rotation in the traditional maize triangle will differ totally from the pasture options of lucerne and medics together with cash crops such as wheat, barley, canola, oats suitable in the Western and Southern Cape production areas. In summary the advantages enjoyed by properly planning the crop rotation system that suits your particular production area must include better moisture conservation, reduce financial risk, reduce mechanisation costs and improve crop and soil health to ensure a sustainable farming future.